The Georgia Secretary of State's Office opened an investigation Thursday into whether voters in the Doraville area have been voting in the wrong state House district. Nearly 700 voters who should be included in House District 81, represented by state Rep. Scott Holcomb, were incorrectly placed in House District 79, he said. They might have been assigned to the wrong district since 2012, the first election year after the Georgia General Assembly redrew state legislative districts, he said. 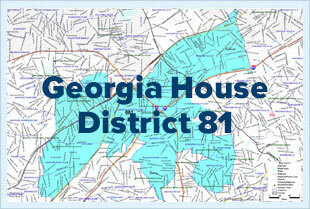 "It is a mess," said Holcomb, a Democrat whose district covers parts of Brookhaven, Chamblee, Doraville, Peachtree Corners and Tucker. "It needs to be fixed immediately." The misplaced voters, located in the Doraville North precinct, didn't appear to alter the outcome of any elections, he said. Both Holcomb and his neighbor in House District 79, state Rep. Tom Taylor, have been in office since 2011. Under state law, county election offices are responsible for placing voters in the appropriate districts. Holcomb faces Republican Ellen Diehl in the Nov. 6 general election. In House District 79, Republican Ken Wright and Democrat Michael Wilensky are campaigning to replace Taylor, who isn't seeking re-election.